I disconnected my site from QPilot - how do I reconnect? In some cases, you may have disconnected your site from QPilot. For example, you may have changed hosting or deleted the user that initially connected your site to QPilot. If your store was originally connected as (https://mywoostore.com/), then it should be reconnected at the same URL (https://mywoostore.com/). If this is not the case, you'll need to contact online support so that we can advise you on how to reconnect your site. If your site was simply disconnected, you'll see an option to "Connect Autoship" using your existing QPilot Client ID and Secret. 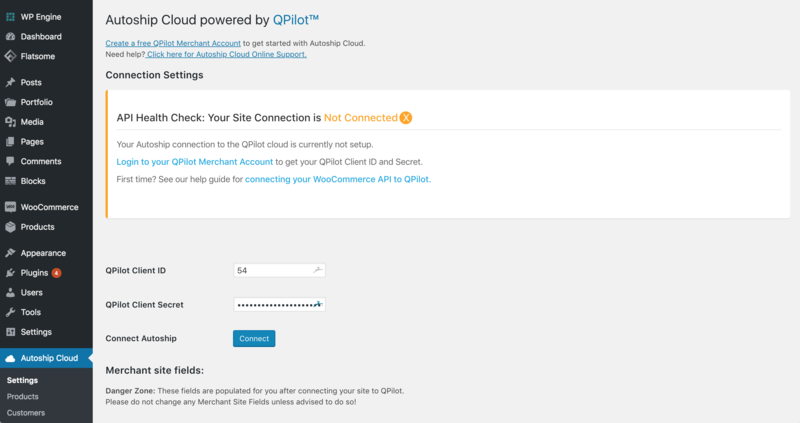 Clicking "Connect" will lead you to a screen to sign into your QPilot Merchant Account using the same email and password you used to register your QPilot account. Once you've completed this, you will be directed back to your site and can confirm that your site was successfully reconnected! If your site was disconnected and you need update the QPilot Client ID and Secret, you should clear out the existing QPilot Client ID and Secret and click "update" before connecting your site to QPilot again. Step 3: Test Integration to confirm! Once you've reconnected your site, you should confirm that your API Health Check status is Healthy. You can re-test this at anytime by selecting "Test Integration". Why do I need to connect my store to QPilot?